Do Savannah - "Familiar, unique jazz at the Mansion"
Savannah’s Coastal Jazz Association is bringing another world-class musician to town this Sunday. Piano wunderkind Ben Rosenblum is set to play at The Mansion on Forsyth Park. Coastal Jazz Association is most known for putting on the annual Savannah Jazz Festival. They also sponsor scholarships and other efforts to further the cause of jazz appreciation and education. Sunday’s show will feature Rosenblum accompanied by drums and bass. While this will be Rosenblum’s first trip to Savannah, the title track was composed and named while performing for a competition in nearby Jacksonville, Fla. Fans of live jazz will appreciate the classic method in which the album was recorded. Rosenblum says the album was not tracked like most modern recordings. The title track is a sprawling dreamy piece that opens with Rosenblum’s dynamic piano traveling far and wide before the drums and bass come in to find an immediate groove. It’s fitting for the young musician whose uncommon skills have brought him all over the world. Rosenblum’s piano has allowed him to be an ambassador of jazz from his native New York to New Delhi. He and his band relish the opportunity to travel and are currently enjoying a trip by car through the states before making a return trip to play in Japan. The demanding tour schedule will allow the band to bring a polished show to Savannah on Sunday, but Rosenblum says it is his native New York City that made the pianist what he is today. The pianist is a graduate of the famed Columbia-Juilliard program, but the education earned in the city’s jazz clubs and alongside its elders have had an equal part in creating the accomplished performer. Rosenblum’s schooling at home along with his travels have helped nurture his intense interest in different genres of world music. He says his eclectic tastes will help create a distinctive experience for Savannah jazz fans. Friday night New York City jazz pianist/composer Ben Rosenblum celebrates the release of his second album, River City (One Trick Dog), at the California Jazz Conservatory’s Rendon Hall. A graduate of the Columbia-Juilliard jazz program, he’s an arrestingly mature composer with a beautiful touch. He’s joined by Monterey-raised bassist Kanoa Mendenhall, a rapidly rising player who’s the daughter of respected pianist Eddie Mendenhall, and New York drummer Ben Zweig. Ottawa Citizen - "New York jazz pianist Ben Rosenblum brings his prodigious talents to Canada in early December"
"Pour l’avoir attrapé au Maelström au printemps dernier, je sais que le New-Yorkais Ben Rosemblum et ses acolytes ont un talent particulier pour faire groover les petites salles. Même pour les néophytes de la planète jazz (dont je suis), son mélange de compositions, de pièces mythiques et d’improvisation a un pouvoir hypnotique assez singulier. À l’invitation d’Arté Boréal, il exercera cette fois sa magie au Bar le Saint-Angèle, un sympathique repère près des remparts, vendredi et samedi soirs, dès 20h30. Le pianiste et accordéoniste sera accompagné de Jonathan Chapman à la contrebasse, Ben Zweig à la batterie et du guitariste montréalais Sam Kirmayer, qui se joindra à la bande en tant qu’invité spécial." Jazz pianist Ben Rosenblum delivered an inspired, heartfelt performance at the famous Jazz at Kitano club on November 10, 2018. The live performance was a record release party for his new album, River City, off of One Trick Dog records. Rosenblum is young and very new to the jazz scene, yet already an award winning jazz pianist, composer, and more recently, accordionist. Hailing from New York City, Rosenblum brings to life a concoction of many styles and influences that are closely held treasures in the jazz world. From Bill Evans, and Wynton Kelly, to the swing jazz idiom, and rearrangements from blues to traditional music, Rosenblum moves gracefully across genres and sound textures. It is hard to believe he is so young, as it takes years of training to reach his level of skill and mastery in the uniquely elegant, complex genre that is Jazz. To start the night off, “Seeds of Sin,” a Wayne Shorter tune, kicked into a progression that emanates the spirit of freedom, the core spirit of jazz, and immediate interlocking instrumentation with his fellow band mates. Drummer Ben Zweig really kicked into gear on this track, swinging, singing, and setting the pace for the evening. Eloquent textures of sound, and strong communication between band mates allowed the music to flow and take the audience on a journey. The second track performed, “Dolphin” by Luis Eça, begins with a sweet and silent introduction, captivating and taking off in subtle yet impactful fashion. Bassist Kanoa Mendenhall played this tune mostly with her eyes closed, fully immersed with every note played, and perfectly in sync with the drummer’s rhythm and Rosenblum’s piano. This track settles into a calming, intoxicating feeling, which can only be felt and truly appreciated when experienced live. Next up, “Delilah” by Victor Young, was quite reminiscent of the jazz standard “Take Five.” Traditional Spanish music sensibilities were intertwined into one particular segment of this musical piece. Rosenblum has traveled extensively, playing around the world, and various influences taken from his experiences are evident in his musical choices. This tune was tastefully executed, played with the infectious romance of ballad format. This music invokes contemplation, warmth, and wonder. Rosenblum spoke with sincerity about this next number, stating it is a “ballad near and dear to my heart”, he also stated “this is one of my mother’s favorites” – “When Sunny Gets Blue.” . Tension builds , melodic and with intriguing choices of musical notes, this enigmatic and captivating number highlights the Bill Evans influence on the young Rosenblum. The next track was played on accordion, the classic ‘Scandelli” to be more specific, Rosenblum usually plays the Bell accordion when he plays this particular instrument, so this was a rare moment for him and the audience. Playful, masterful use of accordion in the jazz idiom, this is quite rare to see for any audience, even in New York City where anything can happen. Rosenblum has recently traveled to Eastern Europe to perform, with many new opportunities opening up due to his more recent musical excursion with the accordion. The new album’s title track, “River City” about a “scenic town” in Florida, was a major highlight of the evening. “Blues for Stephane,” which is the second track off the new album, was another major musical highlight indeed, moving with power and precision. Ben Rosenblum is undoubtedly a rising star in jazz, and a promising new voice that bends and even defies genre. This live performance translated his new album in a way that left you feeling like you truly experienced something uniquely in its own class, a collective and immeasurable experience that only music has the power to do. It is exciting to watch Ben Rosenblum evolve, and to watch the Ben Rosenblum Coastal Trio continue to grow into the cohesive unit that they are. It is with certainty that there is much more to come from this rising talent. 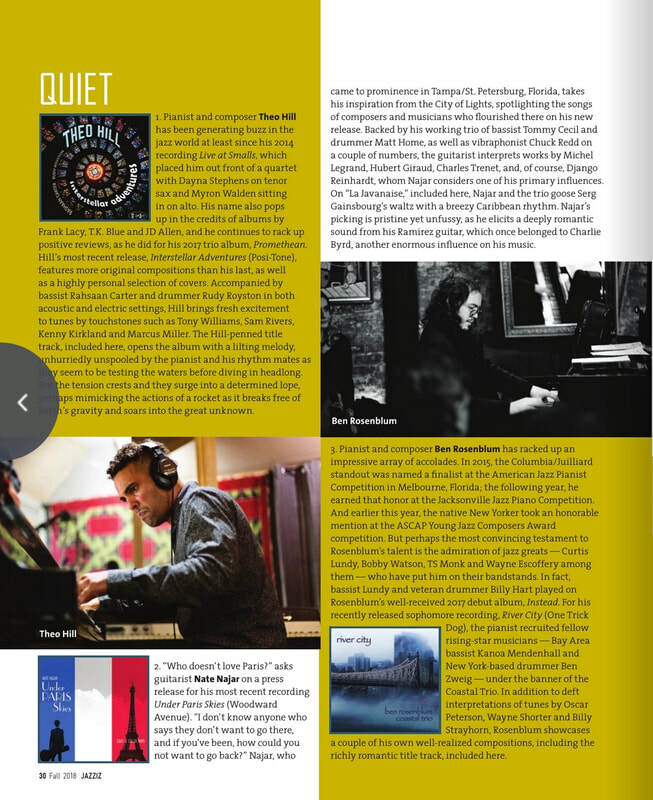 (Featured in the Fall 2018 Sampler CD): "Pianist and composer Ben Rosenblum has racked up an impressive array of accolades. In 2015, the Columbia/Juilliard standout was named a finalist at the American Jazz Pianist Competition in Melbourne, Florida; the following year, he earned that honor at the Jacksonville Jazz Piano Competition. And earlier this year, the native New Yorker took an honorable mention at the ASCAP Young Jazz Composers Award competition. But perhaps the most convincing testament to Rosenblum's talent is the admiration of jazz greats -- Curtis Lundy, Bobby Watson, TS Monk and Wayne Escoffery among them -- who have put him on their bandstands. In fact, bassist Lundy and veteran drummer Billy Hart played on Rosenblum's well-received 2017 debut album, Instead. For his recently released sophomore recording, River City (One Trick Dog), the pianist recruited fellow rising-star musicians -- Bay Area bassist Kanoa Mendenhall and New York-based drummer Ben Zweig -- under the banner of the Coastal Trio. In addition to deft interpretations of tunes by Oscar Peterson, Wayne Shorter and Billy Strayhorn, Rosenblum showcases a couple of his own well-realized compositions, including the richly romantic title track, included here." Blast Magazine (Toronto) - Click for Full Review. BEN ROSENBLUM COASTAL TRIO/River City: An award winning young up and comer, this jazz piano man has got loads of the classic vibe at the tip of his fingers, always raring to go. An almost impressionistic set, there's loads of laid back after hours feeling playing on display here. A smart bet for those who want something to get lost in, this set will take you to the places you really want to go. Ben Rosenblum is a jazz pianist and composer based in New York City, and a recent graduate of the joint program between Columbia University and Juilliard School of Music.”River City” is Ben’s second trio album as a leader, featuring two of Ben’s long-time collaborators and contemporaries, Kanoa Mendenhall on bass and Ben Zweig on drums. The album features three original compositions and six tracks from the jazz canon, selections chosen from the group’s repertoire after years of touring together. Played very tasteful and sophisticated, that album shows how a piano trio should sound. Pianist/composer Ben Rosenblum leads a modern sounding trio with Kanoa Mendenhall/b and Ben Zweig/dr through a mix of jazz standards and originals. He shows a strong soulful touch on the hip take of Oscar Peteson’s “Blues for Stephane” and continues his blue hues on a bopping “Seeds of Sin” guided by Mendenhall’s [sic] cymbals work. Elegaic ivories float on a rich and impressionistic “The Dolphin” with a solo read of Billy Strayhorn’s “Lush Life” rich and evocative. The team flows with gentle ripples on the original title track and “Blue Water” slinks with style. A clever “Chain Chomp” has an extra kick with Zweig’s drums and Mendenhall gets a chance in the spotlight as he leads into the lurking Victor Young classic “Delilah.” Traditional and modern. If you’re a fan of classic jazz piano – melodic, emotional, technically masterful and swinging – catch New York-based Rosenblum while he’s in town. Just 24, he started winning awards in 2010, graduated from Columbia-Juilliard in 2016 and released his debut album, “Instead,” in 2017. His second, “River City,” came out in 2018. He’s not wasting any time. Rosenblum will be at Jazz Central with bassist Jeremy Boettcher and drummer Peter Johnson. On Sunday, you can find him at the Ted Mann in “The Call,” a free concert with U of M singers, countertenor Ryland Angel (with whom he has worked on several projects) and Wilco guitarist Nels Cline. Most young jazz musicians have to struggle to get noticed by the scene’s veterans, and a player making a debut album is foolish to expect to make a splash with the critics right away. So far, Ben Rosenblum is having little trouble bucking these tendencies. 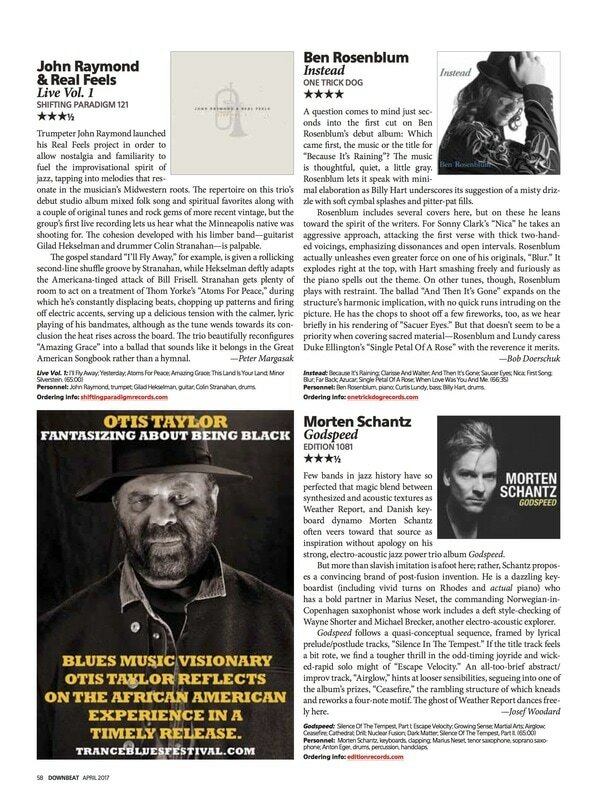 The pianist’s currently riding high on the strength of a remarkable first record, “Instead.” It features superstar sidemen Curtis Lundy on bass and Billy Hart on drums, and it garnered a four-star review from DownBeat magazine. Such unusual amounts of early success could have sent him into a holding pattern, but he’s already exploring ideas about where to go next. “Instead” is in a classic post-bop style, and Rosenblum displays complete mastery of the genre’s technical and emotional requirements, even though he’s only 24 years old. Still, in the spirit of the restless creativity that drives most jazz, his overall conception is changing day by day. On his tour, which includes Saturday’s concert at Merrimans’ Playhouse in South Bend, Rosenblum and his road band — bassist Marty Jaffe and drummer Ben Zweig — are doing about half of the songs from “Instead” alongside entirely new material. The new stuff will likely involve some exotic scales and modes. Rosenblum has been toying around with ideas about incorporating sounds from a variety of other cultures, including Brazil, Ireland and Japan. With bandmates Jaffe and Zweig, Rosenblum pursues the music’s challenges with youthful daring. For his sessions with the distinguished older masters Lundy and Hart, the nominal leader of the date was happy to play the role of student as much as boss. Even on original Rosenblum compositions, the pianist didn’t dare tell Hart what to play, for instance. Hart, whose long career included extensive stints in the bands of Wes Montgomery and Herbie Hancock, particularly shines on a fast, complicated song called “Blur.” When Hart was running through the rhythms in rehearsal, Rosenblum was so enthralled that he asked if Hart could make a note of what he was doing, because Rosenblum hoped the drummer could re-create the percussion parts exactly the same way for the recording. “Billy said that it was the only way that song could be. He said, ‘That’s the only thing I hear for it. I don’t have to write it down or anything. I’ll play it that way because that’s the way it’s supposed to go.’ I said OK!” Rosenblum says with a laugh. Rosenblum honed his chops at the Juilliard School of Music and Columbia University, and developed his broad musical interests at a hip workshop he co-founded, called the Columbia Jazz House. The scene was so noteworthy that the New York Times even ran a story about the Jazz House in 2015. Rosenblum and a loose group of friends hung out, jammed and put together concerts that ranged from straight hard-bop to a full program of Pokémon video game music. Music, and more specifically, JAZZ is very much alive and well in New York. The thriving, young, and talented jazz pianist Ben Rosenblum delivered an inspired and focused performance at the intimate Mezzrow jazz club. Nestled in the famous Greenwich Village neighborhood of New York City, Mezzrow provided the appropriate backdrop for up-and-coming Ben Rosenblum’s record release show. Out now on One Trick Dog records, Instead is Rosenblum’s carefully crafted and innovative solo debut. Featuring six original compositions, Instead showcases Rosenblum, backed by his musical mentor Curtis Lundy, and the legendary jazz veteran Billy Hart. They are both featured on this impressive debut record. Their intense performance supporting Rosenblum burned with the transcendence and spontaneity that could only be jazz. Curtis Lundy has the aura of a jazz legend, and rightfully so. Having played with Betty Carter, Bobby Watson, John Hicks, Johnny Griffin, and the Steve Nelson Quintet, Lundy has quite an impressive resume. His double bass playing technique, and skills as a composer and arranger came through with precision during this performance. Billy Hart, aged 76, played with youthful exuberance and grace the entire evening. A true legend in not just the jazz world, Hart got his start playing with Otis Redding and Sam and Dave. He also played with greats such as Wes Montgomery, Buck Hill, Shirley Horn, Joe Zaniwul, Pharoah Sanders and countless others. Hart made formidable contributions as a member of Herbie Hancock’s sextet (1969-1973), Stan Getz (1974-1977), and as a player on the funk/jazz fusion Miles Davis record On the Corner (1972). Lundy and Hart are veterans who appeared to have fresh life breathed into them supporting the rising Rosenblum. The beginning notes of the record release performance for Instead were seamless, ornate, and fluid. “Saucer Eyes” is a Randy Weston tune and served as the barn-burning opener of the show. The beautiful bossa nova “And Then It’s Gone” featured textured melodic lines by Rosenblum that is reminiscent of Bill Evans. The straight ahead jazz of “Clarisse and Walter” is an original masterpiece and featured stellar drumming by Hart and the musical interplay, space, and vernacular that can only be truly captured live. The ephereal melancholic “Because It’s Raining” featured bass-driven groove with a romantic edge. While soothing, the music keeps you on your feet and not wanting to miss a single moment of magic. “Blur”, performed in the bop paradigm, lives up to its name and blurs the lines and limitations all too often seen in art and music. Ben Rosenblum expresses and smashes thematic sentiments in his playing, and without limitation. “Summertime”, a bonus track from the new album, closed us out in style. Raindrops from heaven poured down with style and grace from Rosenblum’s piano. As the baton is passed down from the previous generations to the new, it is evident that there is much more to come. "A question comes to mind just seconds into the first cut on Ben Rosenblum's debut album: Which came first, the music or the title for "Because It's Raining"? The music is thoughtful, quiet, a little gray. Rosenblum lets it speak with minimal elaboration as Billy Hart underscores its suggestion of a misty drizzle with soft cymbal splashes and pitter-pat fills. "Long ago, the romantic paradigm of the hard-scrabbled, autodidact jazz musician living in a cold-water Harlem flat, playing the heyday of 52nd Street has been replaced by the pristinely-prepared, conservatoire-trained technical wizard mounting the concert stage, performing the standards like a classical piece and offering original compositions that span the genre spectrum and beyond. This new paradigm often results in sterile music delivered with a dull precision. "Sure, the player has chops. But why does he or she sound like a mere technician?" What is it that is lacking in note perfect playing? Humanity, that's what. However, there do emerge conservatoire aces with grit in their imaginations and a facility to express such in their playing. Ben Rosenblum is one such performer/composer. The Julliard-Columbia trained pianist brings a freighter of technique to the keyboard, while still maintaining enough earthiness in his playing to satisfy even the fussiest listener. On his debut recording, the precociously young musician treats us to an even dozen (including the cleverly hidden "Summertime" bonus track). Rosenblum incorporates the percussive nature of a Don Pullen-Cecil Taylor with the melodic finesse of a Gene Harris-Alan Broadbent. He winds these considerable influences in with his own impressive talent completely supported by drummer Billy Hart and bassist Curtis Lundy. 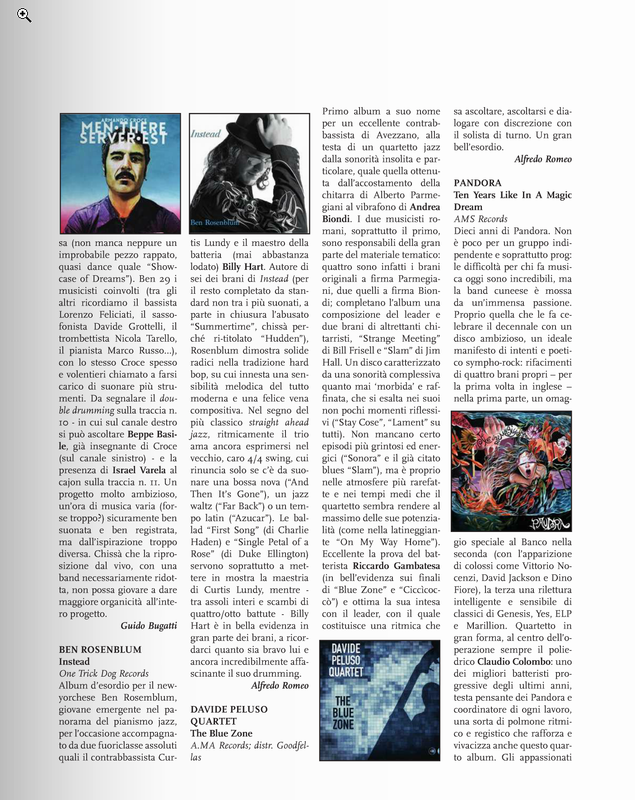 That is heady company for a debut but certainly more than warranted considering the music produced. Highlights include a top-shelf interpretation of Sonny Clark's "Nica," and Duke Ellington's "Single Petal of a Rose." It will be interesting to hear this young talent take a hard turn into something very new." Ben Rosenblum is an up and coming jazz pianist/composer residing in New York. On his debut album Instead he has enlisted the help of jazz veterans Curtis Lundy (bass) and Billy Hart (drums). This is the work of a musician mature beyond his years. The album contains six originals and five covers, just over sixty minutes of some of the catchiest hard bop flavoured jazz you will hear this year. The beginning track "Because It's Raining" is a lovely piano based jazz track with slight variations in tempo and subtle yet complex drumming. Rosenblum's playing is both colourful and fluidic adding a wonderful melody which made me hit the repeat button more than once. "Clarisse and Walter" is a bit more jaunty and upbeat as the piano, bass and drums really start to cook with fiery playing all around. "And Then It's Gone" is another melodic gem before a couple of covers grace our ears; Randy Weston's "Saucer Eyes" and Charlie Haden's "Nica". This is traditional hard bop fare, both catchy and totally irresistible. The bass and piano solos in "Saucer Eyes" are particularly impressive. How does one emerge on the scene in a trio format and be distinctive? Well, one way is to bring some original material and take ownership of covers. Pianist Ben Rosenblum accomplishes this with his debut, Instead (One Trick Dog Records, 2017). Accompanying Rosenblum are Curtis Lundy, bass; and Billy Hart, drums. Rosenblum successfully avoids sounding ordinary by steering clear of the standards, popular jazz songs that have been covered ad nauseam. Instead, perhaps a hint of the thinking behind the album title, he composes six original songs and reinterprets five others that are a bit off the beaten path. Rosenblum and his sidemen deliver each song with fire and energy, especially the faster pieces. As the leader, he is out front most of the way, but he doesn’t dominate. Lundy and Hart complement him well when the piano has the lead, but they also get their moments to stretch out as well. Among the standout originals are “Because It’s Raining,” “Clarisse and Walter,” “Blur” and “Azucar.” The trio also delivers favorable renditions of Charlie Haden’s “First Song,” Duke Ellington’s “Single Petal of a Rose” and more. "Ben Rosenblum’s debut album Instead is a work that was years in the making. The young pianist has played in violinist Ben Sutin’s acclaimed jazz/klezmer group Klazz-Ma-Tazz for several years now since their inception. Rosenblum’s versatility as a musician has helped shape his unique style and this record reflects his unique training in various subgenres from hard bop to bossa nova. You can hear influences from Rosenblum’s training and from other projects he has been involved in throughout this record. Jazz heroes Curtis Lundy and Billy Hart add an experience and dimension that is perfectly befitting for Rosenblum’s compositions. Lundy, best known for his work in Betty Carter’s band, also has been sampled by Kanye West’s “Jesus Walks” from his arrangement “Walk With Me”. Billy Hart has a long running list on his resume which includes Otis Redding, Sam and Dave, Pharaoh Sanders, Wayne Shorter, Wes Montgomery, and many more. His work with Miles Davis on 1972’s “On the Corner” is appropriate as the album courses through many jazz idioms including elements of Davis’ work. Ben Rosenblum’s star continues to rise and this record pays homage to past influences while maintaining originality and in the process, claiming a new voice in modern jazz." "The recent music grad who more than proved himself at the student level by winning all there was to win now steps up to take his place as the leader of a jazz piano trio with Billy Hart and Curtis Lundy watching his back. The result is a tasty debut that can be either an easy going soundtrack to your cocktail hour or the getaway to the hip jazz club hiding in your headphones. Certainly the kind of cat that's going to go the distance; with a purely bodacious debut like this, only good things can flow from here. Well done and right on the money." "Pianist Ben Rosenblum displays a warm and graceful touch with a homage to vintage bebop on this collection with Curtis Lundy/b and Billy Hart/dr. He floats over Lundy’s bass on his own “Far Back” and uses space as a sound on the peaceful “And Then It’s Gone” flowing with delight like droplets on “Because It’s Raining.” Hart gently nudges with the ride cymbal on randy Weston’s “Saucer Eyes” and the team bops the blues on Sonny Clark’s Nica” and closes out with a strutting read of “When Love Was You and Me” right after the leader wafts on the ivories with minimal support on a luscious read of “Single Petal of a Rose.” Got the hands of a diamond cutter here." Ben Rosenblum, a young promising up and comer in the New York Jazz piano scene, released his debut album under One Trick Dog Records. Rosenblum is accompanied by legendary musicians such as bassist Curtis Lundy and drummer Billy Hart (an absolute master). Author of 6 of tracks on the album, complemented by a few not overly popular Jazz standards, apart from the over-covered ‘Summertime.’ Rosenblum shows his deep knowledge of traditional hard bop, upon which he overlays a melodic touch that’s entirely modern and innovative, along with solid composing skills. In line with the straight ahead jazz tradition, rhythmically the trio like to stick with the good old 4/4 swing, with the exception of a bossa nova (‘And then it’s gone’), a jazz waltz (‘Far Back’) and a Latin piece (‘Azucar’). The ballads ‘First Song” (by Charlie Haden) and ‘Single Petal of a Rose’ (by Duke Ellington) showcase Curtis Lundy’s mastery, while solos and long 4s/8s exchanges throughout the entire album remind us (not that we need to be reminded) how capturing and incredibly skillful and fascinating Billy Hart’s drumming is.